The Caregiver's Journal- Peace of mind for Caring Hearts and Helping Hands! An innovative tool offering help to family caregivers when it’s most needed. If you have a family member or loved one in a hospital or rehab facility, your life needs simplification–immediately! The Caregiver’s Journal will make the visit easier and allow you to stay more in control. Coordinate communications among multiple caregivers. Refresh your memory about visits with medical staff, doctors and therapists. Jot notes to yourself, the patient and other caregivers…you will love this simple, easy-to-use tool! Engaged in caregiver/patient relationships? 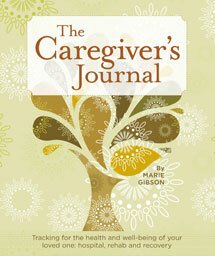 You need The Caregiver’s Journal. Warm wishes for your loved one’s speedy recovery. Quantity discounts and customized branding available.